Vancouver, British Columbia--(Newsfile Corp. - March 21, 2019) - Great Bear Resources (TSXV: GBR) (the "Company" or "Great Bear"), today reported drill results from the Dixie Hinge Zone ("DHZ") and Dixie Limb Zone ("DL") at its 100% owned Dixie Project in the Red Lake District of Ontario. Drill hole DHZ-031 intersected four significant gold bearing quartz veins along a 141 metre wide zone of increased quartz veining and alteration in the DHZ vein system. c) 0.50 metres of 60.72 g/t gold. The high grade intercepts in DHZ-031 occur 20-60 metres west of previously reported drill hole DHZ-023 which included 3.40 metres of 31.60 g/t gold (see news release of February 21, 2019). 26 of 42 drill holes (62%) completed by Great Bear along 240 metres of strike length of the DHZ that has been drilled to date have intersected intervals containing greater than 15 g/t gold. Results of shallow drilling of the Dixie Limb Zone are also provided in Table 2. Highlights include 39.20 metres of 2.07 g/t gold starting at approximately 25 metres depth, including 9.20 metres of 5.43 g/t gold which includes 0.70 metres of 20.46 g/t gold. Chris Taylor, President and CEO of Great Bear said, "The Hinge Zone continues to rapidly expand as we keep stepping out along strike and at depth. In our most recent results, drill hole DHZ-031 intersected a gold-bearing quartz vein network consisting of multiple high grade veins within a 141 metre (462 foot) wide drill interval. All current drilling is designed to cross the Hinge Zone at approximately right angles, meaning the interval widths are approximate true widths. The vertical depth of the DHZ-031 intervals ranges from approximately 60 to 190 metres from the surface. The scale and strength of near-surface multi-veined gold mineralization at the Hinge Zone continues to impress." An updated long section through the Hinge Zone is provided in Figure 1, showing the location of current reported drill intercepts. Images of high grade gold mineralization from DHZ-031 are shown in Figure 2. The Company continues to undertake a fully funded, 30,000 metre drill program that is expected to continue through 2019. In order to accelerate the program, a second drill rig was added in early 2019. Approximately 13,000 metres of drilling remain in the current program. Table 1: Most recent drill results from Hinge Zone drilling. * reported width is determined to be 90-95% of true width based on intersection points of the drill hole intercept with the geological model and oriented drill core data. Drilling in the Dixie Limb continues to define shallow, wide intervals of gold mineralization, including high grade sub-intervals. The DL drill intervals are presented separately in Table 2. As drill holes like DHZ-026 are collared north of the DL and drill southwards into the DHZ at depth, these holes carry intervals from both zones. Two exploratory step-out drill holes, DL-038 and DL-039 have encountered a new gold-mineralized silicified sediment zone similar to the DL. These holes were drilled from the DL across the D2 axial planar fault that divides the DL from the DHZ towards the south, into an area east of the DHZ. Results are included along with DL drill results in Table 2. These intercepts may represent a new zone of gold mineralized sediments, or may be an offset continuation of the Dixie Limb Zone in the footwall of the fault. Follow-up drilling is required to characterize this new discovery. Two exploratory step-out drill holes, DHZ-024 and DHZ-025 were also completed east of the Hinge Zone fold closure (outside of the Hinge Zone) and encountered anomalous gold values of 0.92 metres of 1.46 g/t gold and 0.50 metres of 1.52 g/t gold, respectively, confirming gold is also present in this new area. Follow-up drilling is required to determine if significant gold-bearing quartz veining is also developed in this new area. Table 2: Current drill results from the Dixie Limb Zone. *All reported widths are drill indicated core length. Insufficient data has been collected at this time to determine true widths. **These drill holes have intersected mineralized sediments in the footwall of the local D2 axial planar fault located south the DL, and east of the DHZ. They may represent a new zone, or offset continuation of the DL. 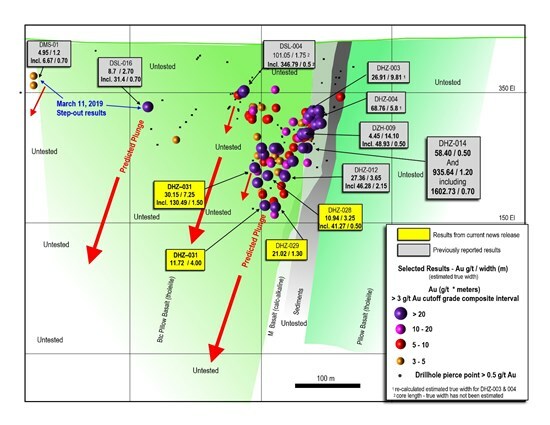 Figure 1: Composite Long section through the DHZ (view to north) as drilled to-date showing currently reported drill results, and the location of recent step-out drilling. New results are highlighted in yellow. 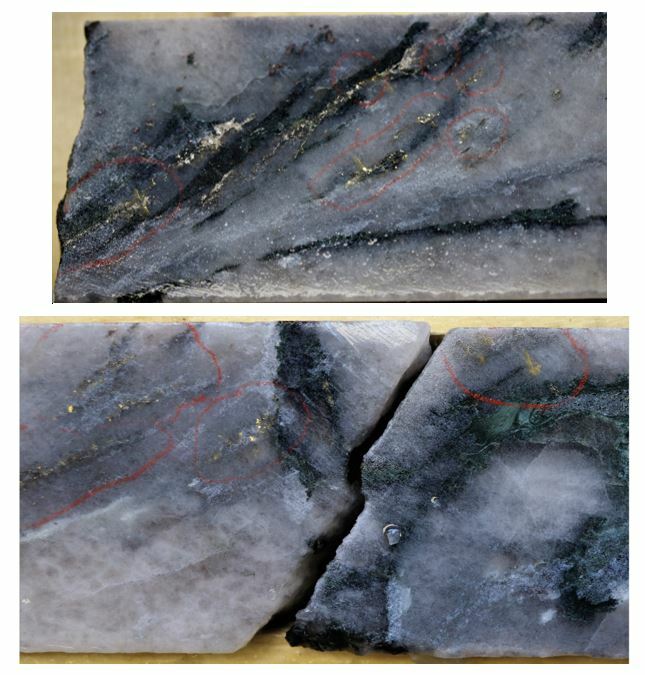 Figure 2: Images of high grade gold in drill core from DHZ-031. Interval returned 1.50 metres of 130.49 g/t gold. The Dixie property is located approximately 15 minutes' drive along Highway 105 from downtown Red Lake, Ontario. The Red Lake mining district has produced over 30,000,000 ounces of gold and is one of the premier mining districts in Canada, benefitting from major active mining operations including the Red Lake Gold Mine of Goldcorp Inc., plus modern infrastructure and a skilled workforce. The Dixie property covers a drill and geophysically defined 10 kilometre gold mineralized structure similar to that hosting other producing gold mines in the district. In addition, Great Bear is also earning a 100% royalty-free interest in the West Madsen, Pakwash, Dedee and Sobel properties, which cover regionally significant gold-controlling structures and prospective geology. All of Great Bear's Red Lake projects are accessible year-round through existing roads.